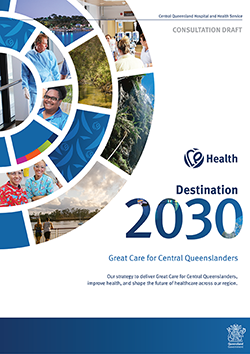 Our Destination 2030: Great Care for Central Queenslanders strategy will shape the future of healthcare across our region, and support our aim for Central Queenslanders to be amongst the healthiest in the world. This road map to 2020 sets out the first three years of the journey towards 2030 and the progress we will make towards our vision of Great Care for Central Queenslanders. We thank all those who shared their valuable suggestions and opinions during the six week consultation of CQ Health staff, patients, consumers, special interest groups, partners and the community. Read more about the Destination 2030 consultation feedback.